A travelogue of our trip with photos. While living in Italy in the mid-1980's we had the chance to tour the Holy Land at a good cost. But because our children were so small, we thought it best to wait till a future date. After our return from leading our 20th and final annual medical mission team to Guyana, South America, in June 2010, we decided that 2011 would be a good year to visit the Holy Land. We chose a tour offered by Aristotle Travel, based in Athens, Greece, because of their long history of providing Christian tours and our confidence in the director, Dino Roussos. We mistakenly expected that 20 or 30 would sign up to go with us, but the cost, the length of the trip, and the "dangerous" destination were quite a deterrent for most of our friends and acquaintances. We recruited five other people to accompany us: Richard & Shirley Bullard, Bob & Patty Null, and Donna Moreton. Our tour originally included Egypt, but the citizens there rose up against and overthrew the oppressive Egyptian government just a month before our departure. Though we were disappointed that we would have to skip the pyramids, we were reminded that the pyramids have been there for thousands of years and we will have other opportunities for a visit to Egypt after the country becomes more tourist-friendly again. Our airline tickets were modified to bypass Egypt. The first few days of our tour were changed from Egypt to Greece. We boarded our first flight out of Fort Smith on Tuesday, 15 March 2011. In Dallas/Fort Worth we changed to an overnight American Airlines flight to London/Heathow. After being served an evening meal, the two of us took sleeping pills which provided a few hours of rest. On Wednesday morning, 16 March, we were served breakfast before our plane landed in England about 7:30. The Nulls arrived on a later flight and joined us on our British Airways flight to Greece. Heathrow airport oddly does not assign departure gates until about an hour before departure. With our flight delayed, this created some frustration as we awaited the assignment on the departure board. The flight was underway in the early afternoon, about an hour late. A movie was shown and lunch was served onboard this 4-hour trip. We were met at the airport by Barbara, a representative of the tour company. Our driver, Dimitris, transported us to the Hotel Herodion at the base of the ancient Athenian acropolis. We had a magnificent nighttime view of the Parthenon from the balcony of our hotel room. About 8:30 we walked a few blocks to a nice taberna where we found great service for a tasty Greek meal. At 11 we took zolpidem and went right to sleep. On Thursday, 17 March, we awakened with the alarm at 7 a.m. Breakfast was provided in the hotel. At 9 o'clock we gathered in the hotel lobby where we met our fabulous guide, Iakovos ("James") Nikolopoulos (a Christian). We began the day with a walk in the rain to nearby Mars' Hill (or Areopagus) where the Apostle Paul delivered his well-known speech about the “unknown god” in Acts 17. Then we climbed to the top of the Acropolis to see the ancient Parthenon (marble temple dedicated to Athena) and the Erechtheion. It had stopped sprinkling by the time we boarded our minibus for a brief city tour. James narrated as we passed by the changing of the guard at the Tomb of the Unknown Soldier, Parliament House, Presidential Palace, Panathenian Stadium (site of the 1896 Olympics), Temple of Olympian Zeus, the Academy, the University and the National Library. We had the remainder of the day at leisure (for shopping) after we finished a big lunch together in the Plaka. While shopping in a jewelry store, the salesman said the Greeks have a saying, "Buy well. Cry once." We found a necklace and earrings in a different shop that we could not leave in Greece. We delayed the "crying" by using a credit card. We walked to a quaint restaurant near our hotel and enjoyed a nice meal with the Nulls. After returning to the hotel, we took some nighttime pictures of the Acropolis from the roof. On Friday morning, 18 March 2011, our group met Dino Roussos in the hotel lobby at 9 o'clock. Dimitris arrived with a brand new minibus for our excursion out of Athens. We were very privileged to have Dino as our guide. He has degrees in Bible and archeology and is the owner/operator of Aristotle Travel, as well as a Greek citizen who preaches for the Church of Christ. On our way to the Roman ruins of ancient Corinth, Dino taught us a great deal about the history of Corinth and the Apostle Paul's visit there in 51-52 AD. Michael and Jeannie had been to Corinth in April 1984 in a group with Dino as guide. Besides being distracted by our two very small children 27 years ago, it was raining so much that we were not able to enjoy the tour. 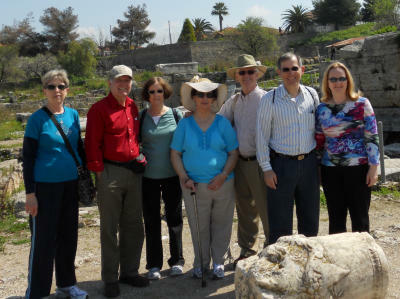 We were thrilled that our second visit to Corinth was a sunny day and we had the best possible guide once again. As we drove past the Saronic Gulf, Dino told us how an outnumbered Greek fleet managed to defeat the enormously powerful Persian armada there in 480 BC. We stopped briefly at the Corinthian Canal before arriving at the excavation site. The ancient Romans unsuccessfully attempted to dig this canal to replace the practice of lifting ships out of the water and dragging them to the opposite side of the isthmus, but the canal was not completed until the 19th century. Transport through the 4-mile Corinthian Canal saves 300 miles around by sea. After enjoying a big lunch together, most of our group followed Dino down a narrow trail through the weeds to see the marble inscription that was discovered in the 1930s which confirms that Erastus was the city treasurer as stated in Romans 16:23. Dino also pointed out a nearby stone that mentions Sosthenes, the ruler of the synagogue in Paul's time, according to Acts 18:17. Our group next stopped at the beach to visit the ruins of a 5th century Christian basilica in Cenchrea, the town mentioned in Acts 18:18 and Romans 16:1. We next stopped briefly at the Aegean side of the canal of Corinth before returning to our hotel. We said goodbye to Dino and went at our own expense to the New Acropolis Museum (5€ each), just a block from our hotel. For supper Michael and Jeannie walked to a restaurant in the Plaka where live Greek music was performed. Saturday, 19 March, was without scheduled activities in the morning. The two of us headed for the ancient Agora about 9 a.m. We passed by the Herodes Atticus Theatre as we climbed the Acropolis. We returned to Mars' Hill to get great photos on this sunny day. After entering the Agora (the marketplace mentioned in Acts 17:17), we wandered about, admiring various ruins and reconstructions. 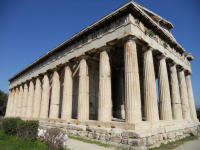 We particularly enjoyed seeing the Temple of Hephaestus, the best preserved Classical temple in Greece. 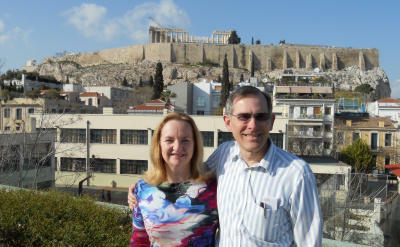 We exited on the opposite side of the Acropolis from our hotel, choosing to walk around rather than over the hill. We had time to shop in the flea market area of the Plaka, then took a shortcut through the ancient Roman Forum. We returned to the hotel in time to check out before 12 noon. With a little time to kill, we found Jeannie a blue cameo necklace and earrings. We returned to the hotel in time to surprise Shirley with a birthday cake. By 1 o'clock our group of 7 was on our way to the airport, about 45 minutes away. Our trip to Amman, Jordan, was aboard Royal Jordanian. We departed Athens on time and were served a good meal during the 2-hour flight. Soon after landing, our 7 passports were collected and our entrance through immigration and customs was expedited in a manner that remains a mystery. While waiting for the return of our passports, we had moments of uncertainty about where we were supposed to assemble. All was well when our Jordan guide, Omar Amsarweh, found us and escorted us to the 11-passenger van which transported us south for 3 hours on a very modern divided highway. We stopped for a bathroom break at the midway point, a tourist shop called Midway Castle. The last 30 miles was on a wide 2-way highway. We arrived at Wadi Musa, Jordan, where we spent the night at Taybet Zaman Hotel and Resort, a renovated 19th century village, unquestionably the most unique hotel in Jordan. After a late supper, we settled into our over-heated room. It was on this date that the full moon was bigger and brighter than in the past 18 years. It looked especially bright in the desert, away from city lights. The abandoned city of Petra is a unique archeological site, all carved from sandstone. It was "lost" to the outside world until 1812. There is a rather long, dusty walk into the old city through a very narrow gorge. All of us were amazed at the size, detail, and beauty of the Treasury (probably misidentified) that appears suddenly at the end of the trail. This most impressive structure was used in the final scenes of the movie, "Indian Jones and the Last Crusade" in 1989. 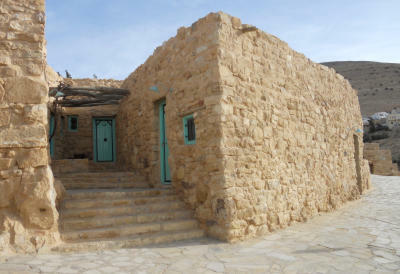 The movie was a major contributor to making the place the most popular tourist destination in Jordan. 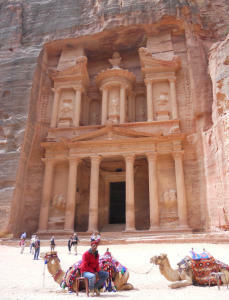 In 2007 Petra was named one of the Seven Wonders of the World. There were many peddlers pestering us in Petra. One girl, making it clear that she did not like Michael rejecting her before Jeannie even saw what she was selling, bluntly said, "Women choose! Men pay!" Near the "Treasury" we bought a small bottle of decorative sand art made from the various colors of sandstone of Petra. Michael and Jeannie also saw many carved-out tombs and the ancient Roman theater (with carved seating for 7,000) before heading back to the entrance to the Siq ("gorge," in Arabic). There we rode horses (at US$3 each) back to the top of the hill where our minibus was parked. After a light lunch at a nice restaurant, we headed to Amman (the capital city of Jordan). We again stopped at "Midway Castle." We checked into the luxury Geneva Hotel in Amman about 4:30. At 7 p.m. our group was joined for supper in the hotel restaurant by Albert Hashweh, vice president of Vision Tours, the employer of our guide. On Monday, 21 March, we left the hotel about 7:30. Kamal and Omar took our group to Mount Nebo where Moses saw the Promised Land for the first and last time before the rest of the Israelites crossed the Jordan River. (See Deuteronomy 34:1-4.) Our guide noted that the day was so clear that we could see a greater distance than usual. We stopped briefly at a mosaic shop in Madaba before heading for Israel. Crossing the border included several checkpoints and having all our luggage x-rayed before leaving Jordan. Our guide had to stay behind in Jordan while our non-English-speaking driver drove us across the Jordan River, which is (surprisingly) just a dry creek bed. He dropped us off with our luggage outside Israeli passport control. The process of entering the country was far more complicated than we anticipated and involved answering more questions than we have ever encountered anywhere else among the 29 other countries we have visited. Michael, as leader of the group, had to go first and last through the line at the last entry point. After the seven of us were cleared for entry, we were a bit alarmed that our Israeli guide, Yatzuck Azuz, was not there to meet us. It was doubly confusing since none of us could get a cell phone connection to call for assistance. We were so relieved that he and our driver arrived about 5 minutes later, thinking they were getting there 45 minutes before us. Obviously, there were communication problems that caused this situation. But all was well after they arrived. We loaded our luggage and bodies onto a small bus that was about three times larger than we required. The extra room was appreciated. Our first stop was at Lido Junction at a long-abandoned dance hall that was once at the edge of the Dead Sea. The water is now a great distance away due to the shrinking size of this inland, salty body of water. The shoreline is the lowest point of dry ground on Earth, at nearly 1300 feet below sea level. Our next stop was for lunch, just outside the ancient ruins at Qumran National Park. We then followed our guide to see the archeological site where a Jewish sect, the Essenes, had lived until the Romans destroyed Jerusalem. In the distance we could see the caves where the famous Dead Sea Scrolls were accidentally discovered by Bedouin shepherds in 1947. We were next taken to Masada where Herod the Great built an elaborate villa and fortress for his own protection, but probably never used. We took a 3-minute ride in the cable car to the top of the mountain to see the ancient remains. Masada is most famous for being the last holdout of Jewish rebels during the period of Roman annihilation of the Palestinian Jews. The Jews at Masada (men, women, and children) were under seige for over 2 years before the Roman army succeeded in reaching and breaking through a gate in 73 A.D. after building (probably with elsewhere captured and enslaved Jews) a massive rock ramp on the east side of the mountain. The rebels then chose to be killed (after killing their own wife and children) by fellow Jews (with only the last man dying by suicide) rather than be killed by Romans or captured to be carried away as Roman slaves. We caught the last cable car back to the base of the mountain at 4:00. We then were taken to the Leonardo Hotel on the Dead Sea for supper and overnight stay. On Tuesday, 22 March, after breakfast at the hotel, we left by 8 o'clock on Highway 90, the longest road in Israel. Our bus driver, Abdullah, was a Moslem. Yatzuck, our Israeli guide, was a disciple of Christ. (He made it clear that he is not a "Jewish Christian," but a "Messianic Jew.") He worked for Sar-El Tours, subcontracted by Aristotle Travel. He talked almost constantly with incredible enthusiasm about the biblical, religious, and secular history of his country. He was so animated that it was sometimes exhausting for us to keep up with him, whether we were listening while walking or sitting. His positive mood generally kept us excitedly delighted to be in the Holy Land. Unlike most tour guides, Yatzuck rarely boringly narrated details but rather used his gift of entertaining to hold our attention. He had friends almost everywhere we went in Israel and he easily made new friends. We all felt truly blessed to have him as our guide. Our bus driver was very nice to us as well. His calmness was a refreshing contrast to Yatzuck's hyperactivity. 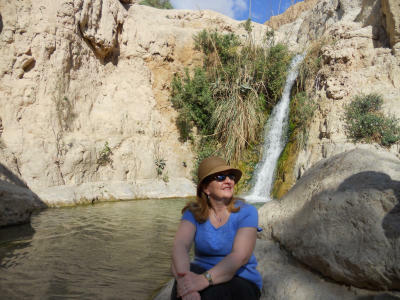 Our first stop was at En Gedi Nature Reserve on the eastern edge of the Judean Desert and near the shore of the Dead Sea. 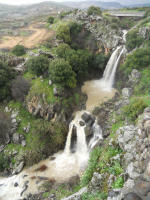 We walked the short distance along Wadi David to the first waterfall, passing many desert ibex (deer) and rock hyrax or "conies" (somewhat like a groundhog). It was in a cave, similar to what we passed, where David spared the life of King Saul in this area. (See I Samuel 23:27 - 24:1ff.) This beautiful place is also mentioned in Song of Solomon 1:14, "My beloved is to me a cluster of henna blooms in the vineyards of En Gedi." Next stop was at the Greek Orthodox church of San Gerasimos. (It seems we only visited here because our guide's father was born in Greece.) Gerasimos was an early Christian whose story includes making friends for life with a lion after pulling a thorn from his paw. Apparently Gerasimos lived where the church was built. 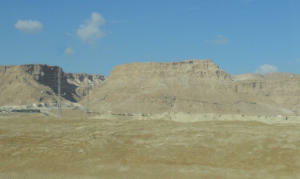 Tradition also holds that Joseph and Mary camped on this spot while fleeing to Egypt with baby Jesus. After passing Jericho we visited a War Memorial in the Jordan Valley where our guide pointed out the name of his friend who died fighting alongside him in 1972. In the Jordan Valley we explored the ancient Roman ruins at Bet Shean, one of the cities of the Decapolis. (See Mark 5:20.) Bet(h) Shean is mentioned 5 times in the Old Testament. With beautiful weather we snapped some awesome pictures. We ate lunch before we left the archeological site. Just as we finished, the temperature quickly dropped and a light rain began. At Bet Alpha we saw the incredibly well-preserved remains of a huge and fanciful mosaic floor of a sixth century synagogue that was lost till 1928. After arrival at Tiberius, we settled into the Golan Hotel, excited that we would stay in the same rooms for three nights. From our room we had a great view of the Sea of Gailee. Supper was served in the hotel at 7:00.
view of Sea of Galilee from our hotel balcony at sunup On Wednesday, 23 March, we were on our way by 7:30. As our guide did on the previous day, he sang a Psalm to us in Hebrew then had Michael read it in English, followed by Yatzuck leading us in prayer. The first morning was Psalm 100; the second day was Psalm 123. Next our group climbed aboard a boat for a short cruise on the Sea of Galilee. Immediately upon casting off (about 9:15), the "Star Spangled Banner" was played as a crew member raised an American flag. At the trip's half-way point, fishing with a net was demonstrated. The boat ride was clearly a thing for tourists, but, nevertheless, was a lot of fun. It was quite inspirational, too, considering the stories in the life of Jesus that involved this inland sea. We were delighted that we did not have to share the ride with tourists not in our group. Though it was a little hazy and a bit chilly on the lake, we took some great photos under partly cloudy skies. After some shopping for souvenirs (where all prices were marked in U.S. dollars, as we later found to be common wherever there were tourists), our bus driver took us to the top of a hill overlooking the Sea of Galilee where many claim Jesus taught His disciples what we read in Matthew 5, 6, and 7, known by all as the "Sermon on the Mount." There were many busloads of tourists visiting the modern Church of the Beatitudes. We next visited the supposed site of John 21, where Jesus met the Apostles on the shore after their unsuccessful night of fishing. This event was after the Resurrection, when Jesus asked Peter three times if he loved Him. A Franciscan chapel is built here. We ate fish for lunch, which the restaurant wanted us to believe came from the Sea of Galilee (from which it has been illegal to fish for the past couple of years to allow the low fish population to increase). Our next stop was Nazareth. Here we visited the Basilica of the Annunciation, built in 1969 over the remains of the site where the angel Gabriel is said to have appeared to the virgin Mary. (See Luke 1:26ff.) This basilica is the largest church building in the Middle East. We then visited a high place in Nazareth, where some believe the angry crowd (mentioned in Luke 4:28-30) tried to throw Jesus over a cliff. It was now mostly sunny, a little chilly and very windy. From here we could see Mount Tabor and Mount Carmel and the Jezreel Valley. We returned to our hotel in Tiberius before 6 p.m.
On Thursday, 24 March 2011, our group headed north on Highway 90 at 8 a.m. Michael read aloud Psalm 121, "I will lift up my eyes to the hills ..." after Yatzuck first read the chapter in Hebrew. After we heard it in English he sang the passage in Hebrew. Our first stop, an hour later, was at Dubrovin Farmstead, which was established in 1884. There we had fun manually activating an antillia well, which has a series of buckets on a belt that bring up water and pour it out as each bucket turns upside down at the top. Michael found that the mechanism got progressively harder to turn as more buckets filled with water. Nearby we visited the swamp preserve in the Hula Valley. We all greatly enjoyed the 3-D film about the 500,000 birds that stop here during annual migration. Not only did we wear 3-D glasses, but the seats moved, water splashed on us, and other special effects entertained us as we watched and literally felt the presentation. The film was over too quickly and we headed out into the swamp. We chose to cut our hike short when it started to rain. Being time for lunch, we ate near the ruins of ancient Pania, long known as Banias. We had the best falafel and grilled chicken. Except for tasting better, lunch was nearly identical to the day before but was US$10 less expensive per person. The restaurant was built adjacent to the river and even had some of the water running through the restaurant. We passed through a couple of Druze villages before arriving at Sa'ar Falls, where we stopped to take pictures of this impressive waterfall and pretty wildflowers and to taste the delicious apples. On a distant mountaintop we could see the Fortress of Nimrod, a castle built by Muslim rulers to defend against a possible Crusaders attack, which never happened in this remote edge of the Holy Land. Leaving this site, our bus climbed into the clouds. We stopped at the top of Mt. Bental, an extinct volcano. It was too foggy to see anything beyond a hundred yards. There are some interesting foxholes here that were once used (and apparently could be used again) to defend Israel from attack from Syria. The ride back to our hotel in Tiberius was uninteresting in the rain and fog. We arrived about 4:45. Supper was from 7 to 8 with our fellow travelers. Yatzuck, our guide, joined our table for conservation and dinner in the hotel. Then everyone packed, as it was our final night at the Sea of Galilee. On Friday, 25 March, we ate breakfast in the hotel, left our suitcases outside our hotel room doors at 7:30, and paid the front desk for incidentals as we checked out. After getting everyone's luggage loaded, we were on our way for another exciting day of sight-seeing and spiritual reflection. In the bus we read Psalm 131. Our first stop was at the Jordan baptismal site that is near the outlet of the Sea of Galilee. 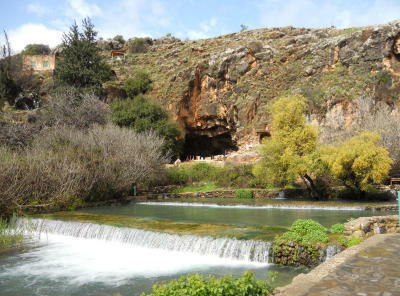 This place probably has no New Testament connection, but is very popular with tourists who want to be baptized in the waters of the Jordan River. Jesus was baptized far to the south, near the Dead Sea (most likely). Next we visited Tel Megiddo, one of the most important archeological sites in the Middle East. Megiddo, mentioned 12 times in the Bible, overlooks and controlled the Jezreel Valley. It was strategically located on the principal trade route between Egypt and Mesopotamia. It was one of the most fought-over cities in the region, being destroyed 25 times. Some think there is a connection to Armageddon, mentioned in Revelation 16:16. We exited the ancient city ruins by walking through the secret tunnel used to access water when the city was under siege. On Mount Carmel we visited the site where it is believed that the prophet Elijah proved that Jehovah was superior to Baal. Michael read I Kings 18:19-46 to the group. It is one of his favorite Old Testament stories. After stopping for lunch, we arrived about 2 o'clock at Caesarea [Maritima] which is mentioned several times in Acts, most notably as the port used by Paul and as the home of Cornelius, the first Gentile convert. 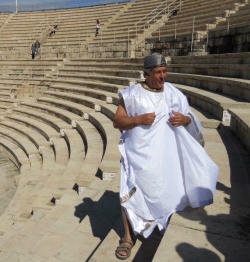 While exploring the Roman ruins at the Mediterranean beach, we were pleasantly surprised at the ancient theater when our guide changed clothes and acted as Pontius Pilate telling his connections to this place. The archeological site closed early at 3:00 sharp due to the Sabbath about to begin. Next we drove by the remains left by the Crusaders and stopped briefly at the ancient aqueducts. Then we headed toward Jerusalem. At 4:00 we dropped off our guide close to his home so he could be with his mother on her birthday. We arrived at Hotel Neve Ilan, near Jerusalem, at 5 o'clock. (The hotel was not far from the site where David slew Goliath, but we did not go there.) Our four rooms were together, two adjacent on each side of the hallway. Without planning we all went to supper around 7 and found a table reserved for us. We were fascinated by the Sabbath activities of the big crowd of Jews in the hotel restaurant. On the Sabbath, 26 March, we left the hotel about 9:15 for the 30-minute ride into Jerusalem. Michael read aloud Isaiah 60:1-5 which was followed by Yatsuk singing in Hebrew and leading a prayer. We drove through a town with an Arab name (Abu Ghosh) that might be the site of ancient Emmaus (see Luke 24:13), but there are two other possible sites; experts cannot agree. We stopped first at the Mount of Olives and were reminded that Jesus was not the first to weep here about a parent-child relationship. (Compare Luke 19:37, 41 and II Samuel 15:30.) The view from here of the old walled city of Jerusalem is magnificent. The weather was perfect for touring and getting good pictures all day. We walked through what might have been the Garden of Gethsemane. Then we crossed the Kidron Valley on our bus. It warmed up enough by this point that most of us left our jackets on the bus before we walked into the old city of Jerusalem through the Lions Gate. We followed the centuries-old Via Dolorosa. Time for lunch was found somewhere in the schedule. And the group stopped along the way while Michael purchased two coins in excellent condition that were in circulation in Jerusalem during the time of Jesus. (See Matthew 22:19-21 and 26:15.) Old Jerusalem is cluttered along narrow streets with all kinds of shops catering to tourists. The old city is thick with religious buildings claiming to contain a landmark of biblical or other historical significance. We saw so many of them that we cannot recall them all. Most are clearly stretching the evidence, with few worth considering that they might be in the right location. Nevertheless, millions of believers travel to visit these sites, and it was clear from what we observed that a sizable number of pilgrims believe they will receive special blessings by touching or kissing these things or places. It seems very superstitious or even pagan to us to venerate what is unproven and unlikely to be sacred. And there are many churches (without "sacred" landmarks) of which their followers just want a presence in Jerusalem. It is worth mentioning here that the men who originally set up some of these sacred sites were, in some cases, merely trying to enable pilgrims to reflect on a biblical scene or event. These meaningful approximate spots or similar settings turned a commemorization into a place where some visiting believers behave as if there are magical powers available for them there. One of the most unexpected things we discovered is that the most popular site claiming to be the empty tomb where Jesus was buried has been completely enclosed in such a way that one must wait in an hour-long line to see any part of it. This structure is inside the huge Church of the Holy Sepulchre, the various sections of it being managed by several different major Christian factions, none of which get along with one another, but all claiming the right to be here at "the world's most holy Christian site." It can be rightly described as a "warehouse" of different churches. It is sad that the Christ they seek to glorify prayed that all who follow Him would be united. (See John 17:20-23.) Even more amazing is that since the days of Saladin (the Moslem conqueror of nearly a thousand years ago) the building belongs to the Moslem Arabs, two families of which keep two different keys used by them to unlock and lock the door every day. It is hard to imagine how this has continued for so many centuries. We wish we could tell more about what we did and saw this day, but too much of it is truly beyond belief and would take too much explanation. A few blocks from our hotel we stopped, just for the fun of it, at a cafe dedicated to everything Elvis. We were back in our rooms about 5:45 and went to supper around 7. The dining room was so different than the night before when so many local families were there to celebrate the Sabbath meal. On Sunday morning, 27 March, after breakfast the group met in our room for Communion service led by Bob Null. We were on our way back to Jerusalem on the bus by 8:30. Because of a traffic jam, the trip into Jerusalem took 1¼ hour. Though not on our itinerary, our guide planned to take us up on the Temple Mount, but the extra 45 minutes it took us to get there made it impossible to get in. We were all disappointed. We visited the Jerusalem Archeological Park adjacent to the Southern Wall and south edge of the Western Wall of the Temple Mount. Here we saw the ruins of the ritual baths and the first century temple compound gates that are now sealed. 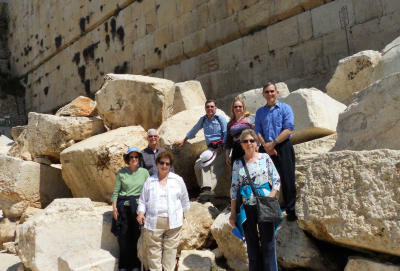 In the above photo our group is among the large stones from Herod's Temple, which the Romans threw off the Temple Mount after destroying the city in 70 A.D., just as Jesus predicted in Matthew 24:1-2. We then watched a 10-minute film about the experience of a Jew taking a sacrifice to Herod's Temple prior to its destruction. "The world's most holy Jewish site" is the sacred spot on the Temple Mount where the Holy of Holies was located in the ancient Temple. We visited the Western (Wailing) Wall, the closest most can conveniently get to what was once the Holy of Holies. At the Wall, men and women must separate by gender into divided areas. It amazes us that some Jews and Christians who venerate this landmark act as if an all-powerful, omnipresent God will better hear their prayers here than anywhere else. After lunch we walked through the ruins of the ancient Roman cardo (or town center, not the same as a forum). Nearby we saw remnants of what is called the Broad Wall because it is 7 meters thick. It was surrounding Jerusalem during the reign of King Hezekiah (8th century B.C.). We left the walled city on foot through the Zion Gate to enter "the City of David." Here we visited what has been traditionally called King David's Tomb, but it is not possible that he was buried there. Even more implausible is the building above the tomb that is traditionally known as the upper room of the Last Supper. We then got on the bus to be taken to the Pool of Bethesda of John 5. This is probably the real thing. There are ruins of at least one church here as well as a Roman temple. Next we visited the Israel Museum where we viewed the large, impressive, outdoor, scaled model of Jerusalem as it was when Herod's Temple dominated the landscape (as in the days of Jesus). 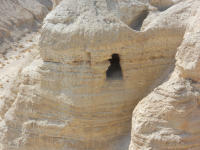 We visited the most popular part of the museum, where the Dead Sea Scrolls are housed. There was a little time for the museum gift shop before we left for the hotel. Near the museum we passed the Knesset (or Israeli Parliament). On Monday, 28 March 2011, the 14th day of our trip and our last day to tour Israel, we left by 8:15 a.m. On the way we read Psalm 134. Our first stop was at 9:00 at the Garden Tomb. 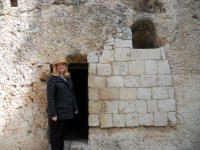 Though it is very unlikely to be the place where Jesus was buried, it is an empty tomb of the right time period, and its peaceful setting is so much more inspiring here, away from the commotion of the more popular site in Old Jerusalem. A guide was assigned to us when we entered. We stopped at a souvenir shop before visiting St. Peter in Gallicantu, traditionally at the house of Caiaphas, where Jesus had a "trial" before the Jewish leaders. "Gallicantu" loosely means crowing rooster and refers to the story in Luke 22:54-62. Michael read aloud for us from a notebook in many different languages of Psalm 88 that he found open in the ancient dungeon of the building. This site or one similar to it could be where the Apostles were locked up in Acts 5:18-19. After lunch our driver took us to Bethlehem, under control of the Palestinian Authority. Our guide, being an Israeli citizen, was not allowed to accompany us across the checkpoint. We expected to get off the bus and show our passports, but we crossed over with little attention given to us. Our first stop was a high quality souvenir shop, quite similar to the one we visited in Jerusalem that morning. Here we were introduced to a man who we thought was to be our guide, but when we left the shop a different guide was made available to us. An 8-seat minibus (with 9 aboard, including a new driver) transported our group to Manger Square. There we entered the Church of the Nativity, built over the supposed place of Jesus' birth. The exact spot is marked where the baby Jesus is said to have been born and it is treated with incredible reverence by many who visit there. This may be the oldest site on Earth of a continual Christian structure. Next we saw the Shepherds' Fields where some believe the angels announced the birth of "a Savior, who is Christ the Lord." Leaving Bethlehem with our original bus driver to re-enter Israel was only a little more troublesome than the earlier border crossing. We picked up our original guide before traveling to Ein Kerem, the likely birthplace of John the Baptist. 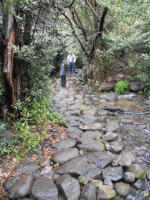 Four of us followed Yatzuck to visit Mary's Spring, then walked up a steep hill to see the Church of the Visitation. The other three people in our group walked an easier path to see the Church of St. John the Baptist, built where it is claimed that John was born. We returned to our hotel about 5:30 and began packing for our departure. On Tuesday, 29 March 2011, we were up very early, getting too little sleep. We were on our way to the airport in Tel Aviv by 2:30 a.m. After changing planes in Madrid and Dallas and a 7-hour time change, we returned to Fort Smith about 10 p.m., 23 hours after our first flight of the day began. Michael has now visited 30 countries, Jeannie 29. We recognized many years ago how our travels enrich our lives. Learning about the history of the lands and peoples, tasting new foods that are commonly eaten by the locals, admiring the creativity of those living or long dead, and meeting friendly or not-so-friendly folks (whether locals or travelers) all combine to change us into (we hope) better people ourselves. This physical and spiritual journey through lands that have a biblical significance will undoubtedly continue to influence, for the rest of our lives, our understanding of the Bible and the Creator & Savior who provided it. May God bless all who read these words.